The 2018 Foxhall Heath Stadium, Ipswich Gala Night is fast approaching and we are pleased to announce that advanced tickets are on sale NOW! Option 1:- You can order your tickets online and choose to have them either sent to you in the post or collect them from the stadium on the day of the event. Please use the link below to be re-directed to the online shop. Advanced Tickets are available until Wednesday 31st October 2018 @ 5pm. Order your tickets now to avoid the turnstile queues on the night! The 2018 Unlimited National Bangers World Championship advanced tickets are also still on sale via the same methods as stated above. 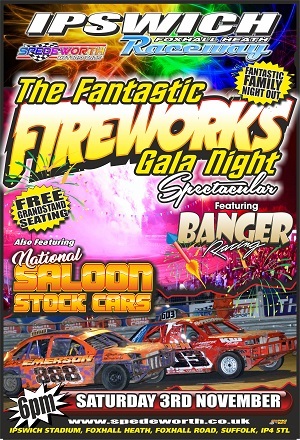 We look forward to seeing all drivers, spectators and staff at the 2018 Foxhall Heath Stadium, Ipswich’s Unlimited National Bangers World Championship and the Gala Night! !